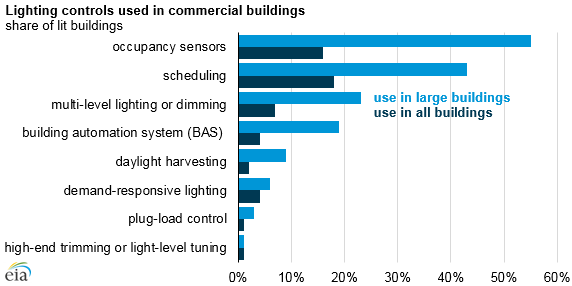 The most recent Commercial Buildings Energy Consumption Survey (CBECS) collected new information about lighting control technologies and strategies in the United States in 2012. Compared with other investments in energy efficiency—such as upgrading heating, ventilation, and air-conditioning systems or replacing insulation—lighting controls are often relatively easy, accessible, and affordable changes. A new EIA report, Trends in Lighting in Commercial Buildings, details these strategies and provides information about lighting technologies in commercial buildings. Lighting control technologies provide the appropriate level and type of lighting to a building and save on electricity costs. The use of these systems is more common in large, lit commercial buildings with at least 50,000 square feet of floorspace. One of the most common strategies involves only using lights when people are in a room or space. Occupancy sensors reduce lighting when rooms are unoccupied by automatically turning off or dimming lights. Occupancy sensors were used in only 16% of all lit buildings in 2015 but in 55% of large lit buildings. A more comprehensive approach called plug-load control automatically turns off lights and wall plugs when people leave a room or space. Plug-load controls were reported in 1% of all lit buildings in 2015 but in 3% of large lit buildings. A second set of strategies controls building lighting based on the time of day. Scheduling automatically dims or turns off lights at certain times of the day. Scheduling was used in only 18% of all lit buildings in 2015 but in 43% of large lit buildings. Building Automation Systems control the mechanical, electrical, and plumbing systems in buildings, but they can also control the lighting. These systems often rely on occupancy schedules rather than sensors and were reported in 4% of all lit buildings and 19% of large lit buildings in 2015. Demand-responsive lighting reduces lighting by dimming or turning off lights at times of peak electricity pricing. This strategy was used in 4% of all lit buildings and 6% of large lit buildings. A third set of strategies saves energy by adjusting the amount of light produced by bulbs to give just enough light to a space for the conditions or the tasks performed there. Multi-level lighting or dimming adjusts lighting power through continuous dimming, stepped dimming, or stepped switching. These devices were used in only 7% of all lit buildings but in 23% of large lit buildings in 2015. Daylight harvesting uses a lighting control and shade system to automatically dim light fixtures when natural light is available or adjusts shades so that natural light and artificial light combine to provide the desired level of lighting. Daylight harvesting was used in only 2% of all lit buildings but in 9% of large lit buildings. High-end trimming or light-level tuning sets the maximum level of lighting to less than 100%. Light-level tuning sets the level even lower if a room or space needs less light. These strategies were fairly uncommon, used in only 1% of both groups of buildings. Note: 2003 CBECS data do not include enclosed malls or strip shopping centers. 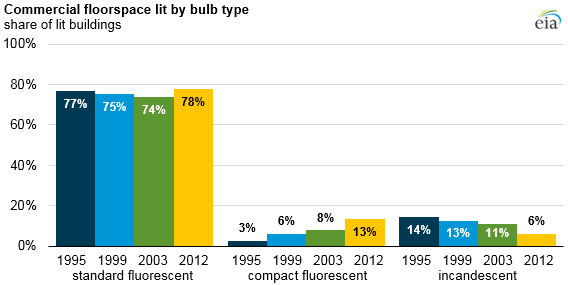 The new report also provides data on the use of different bulb types. Since 1995, CBECS has used similar questions to capture lighting use in buildings, allowing for comparisons across survey years for five bulb types: standard fluorescent, compact fluorescent (CFL), incandescent, high-intensity discharge (HID), and halogen. Information about the penetration of LED bulbs was collected for the first time in 2012. Standard fluorescent, CFL, and incandescent bulbs are the most common bulb types found in commercial buildings. High-intensity discharge, halogen, and LED bulbs are relatively less common in commercial buildings, lighting 5%, 4%, and 3% of commercial floorspace, respectively. Some spaces may be lit by more than one type of lighting, such as an office that uses overhead standard fluorescent lighting with supplemental incandescent task lights. Standard fluorescent lighting continues to be the most widely used lighting type in commercial buildings, covering more than 70% of lit floorspace in each survey since 1995. Commercial buildings have begun to use more efficient lighting types: the portion of lit floorspace illuminated by CFLs has increased steadily, while the share illuminated by incandescent lighting has gradually decreased. The 2012 survey was the first instance where the CFL share (13%) was higher than that of incandescent lamps (6%).